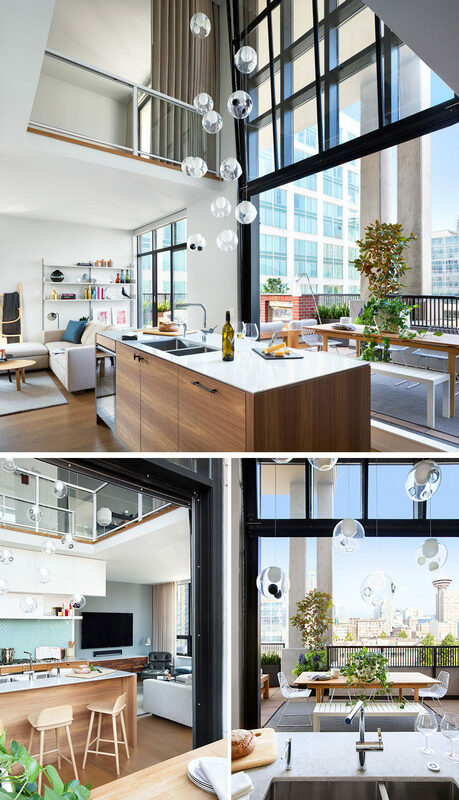 Interior design firm Falken Reynolds have completed the design of a loft apartment in Vancouver, for a couple that split their time between the Canadian city and New York. 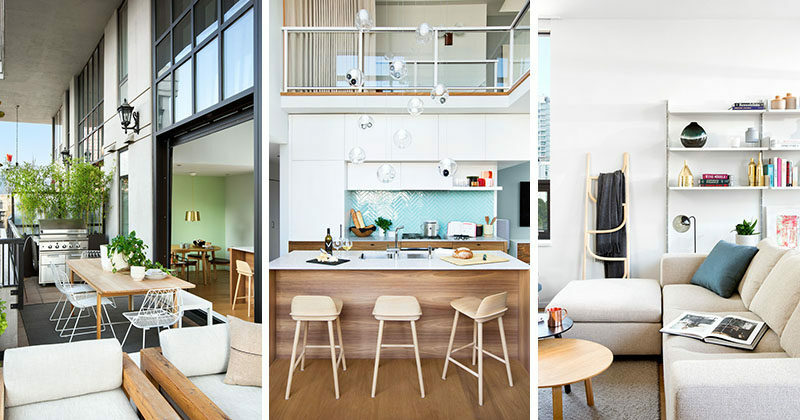 Inspired by Brooklyn’s warehouse lofts, the interior has modern design elements that have been combined with wood to create a bright and welcoming space. 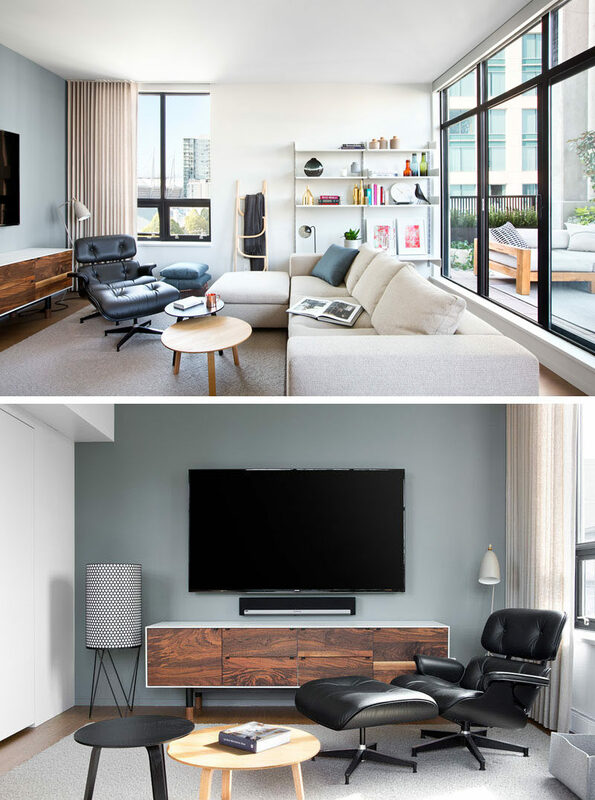 In the living room, open shelving is attached to the wall beside the couch, which is focused on the television (as the the owners are huge sports fans). The kitchen island has a built-in wine fridge, undermount sinks, storage, and the countertop overhangs slightly on one side to enable people to sit at the bar stools. Next to the kitchen is the dining area. A light green wall becomes the backdrop for the wood dining table and chairs, and a simple black framed bar cart ties in with the black window frame and artwork hanging above it. The main living area has large black framed windows that lift up to open the interior to the large balcony outside. 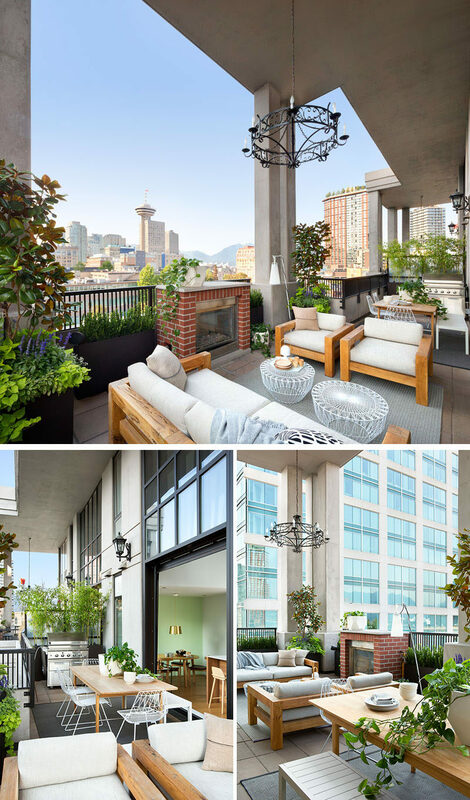 Outside, the balcony, with views of downtown Vancouver, is filled with a variety of places to relax or entertain. There’s a bbq and outdoor dining area as well as a lounge area next to a fireplace. 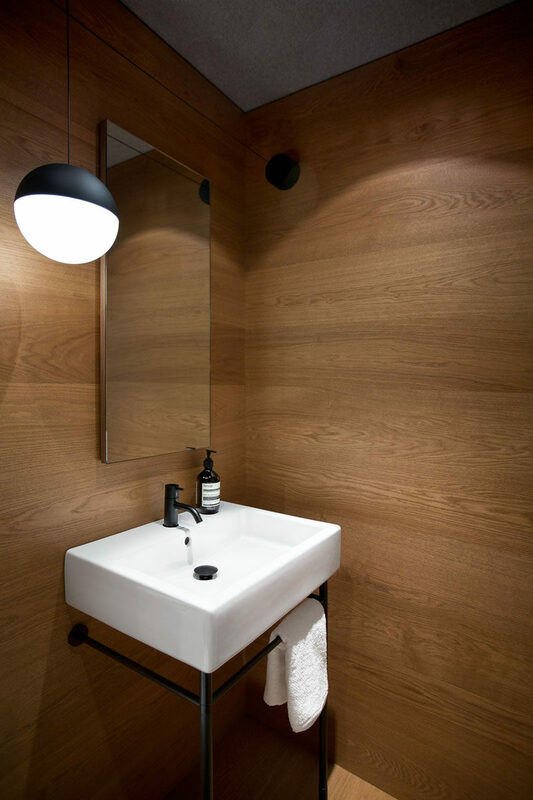 Back inside, there’s a powder room with walls lined in wood. A simple sink with a black frame matches the pendant light hanging beside the mirror. Upstairs, there’s the bedroom with a wood bed frame and side tables. Beside the bed, there’s a a small home office area, with a desk and open shelving. In the bathroom, a large glass enclosed shower takes up one wall, while a wood vanity with dual sinks and a white counter is featured on the opposite wall. White subway tiles have been used for the walls, and dark grey, geometric tiles have been used for flooring.